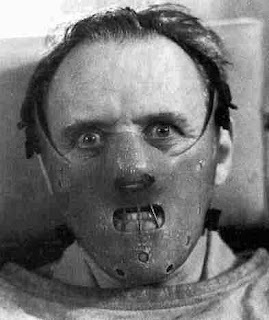 Honestly, I really wanted to call this blog "The Silence of the Lambs"... but today was not about silence.. nor was it about gentle lambs... it was all about blood, guts, gore, and general ick. I really didn't feel quite right when I got up this morning, just a sense of impending doom, and general unease. But, I figured I had eaten too much sushi last night, and pressed on. By the time I got to work, I was feeling a bit dizzy, and my sense of dread had increased... I figured I was just being melodramatic (what? Giddy, melodramatic? ha!). When I opened my car door I heard an inhuman sound... a sort of bizarre screaming which I knew was bad, but couldn't place. I looked around, the sound making me sick to my stomach, when my eyes settled on the goat farm across the street. Three goats in battle... one obviously losing... in a big way. Essentially being eviscerated by the other two... I saw blood and gore... I heard agony. So, quite upset, I run inside. I am nearly immediately descended upon by three "clients," who want to tell me about "last night." And, they do... great, so last night was chaos... lovely. Then another 'client' starts freaking out over nothing. She tries to run off-site three times before we get her inside and, what appears to be, calming down. Yet, she's not calming down. The end result is a suicide attempt, then the girl swallowing the piece of glass she was trying to cut her wrists with. So of course, for the rest of the morning, we're dealing with paramedics, and sheriffs. (oh... and here is where you thank me for leaving out many of the most disgusting details of this kid's behavior). Things only got slightly better. Because, when one kid freaks out, it stresses them all. My first instinct after seeing the goats was to come home and hide in my closet for the rest of the day... I think I really should listen to my intuition from now on.